William Henry Harrison Cram was born in Andover, Vermont in 1841, son of Caleb & Sally (Hadley) Cram. He married Julia E. Baldwin (1841-1909). He died 6 Jan., 1912 (age 71). buried in the Pleasant View cemetery in Chester. Civil War: Co. "E", 16th Reg't Vt. Vols. William moved to Chester when he was quite young and remained in town until a few years after his marriage to Julia. At the time of the 1870 census of Chester, they were living in Chester. He was a carpenter with a house valued at $3,500. They went to Detroit, Michigan for several years but returned to Chester again. He died at the Old Soldier's Home in Bennington, Vt.
HIS Wife who went before him: Julia Ellen Baldwin Cram was born 8 Oct., 1841. She married in Chester, Vt., 8 Dec., 1863, William Henry Harris Cram of Andover. She died of a cancerous tumor, 27 April 1909. She had been sick for a very very long time. She had no children. She has left her most devoted husband, and her half-brother. When Julia was 15 years old, she moved to Chester and lived in the family of Edmund B. Lee, merchant, until her marriage in 1863. William was a Civil War soldier serving in Co. "E". 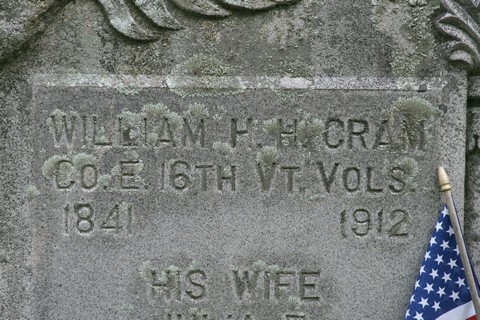 16th Reg't, Vt. Vols. William moved to Chester when he was quite young and remained in town until a few years after his marriage to Julia. At the time of the 1870 census of Chester, they were living in Chester. He was a carpenter with a house valued at $3,500. They went to Detroit, Michigan for several years but returned to Chester again. --Ludlow, 4 July 1890: "Mrs. W. H. H. Cram of Detroit, Michigan is with her father, Jefferson Baldwin to spend the summer. Norris Baldwin, who lives with Mrs. Cram, is also in town." Julia and Mr. Cram bought a place in Chester --a two-story dwelling with a lot of about twelve acres of land --on Cobleigh Street in the village, a place she owned when she died, and in which Hugh Henry, who was the administrator of her estate, asked permission from the Probate court to sell. Julia died of a cancer tumor at her home in Chester, Monday morning, 27 April 1909. Her funeral services were held at St. Luke's Episcopal church with Rev. C. N. Morris officiating. "She had been an invalid for some years suffering from a complication of diseases. Although Mrs. Cram was not able to go out at all in the last years, she will be greatly missed in the community, as she took an interest in everything, helping as long as her strength lasted in the work of the Episcopal church and the Woman's Relief Corp. Everyone who visited her was made welcome and she always seemed bight and happy even when she suffered most. She leaves a husband and a half-brother, A. A. Baldwin of Ludlow." Mr. Cram died at the Old Soldier's Home in Bennington, Vt., 6 Jan., 1912 (age 74). They are both buried in the Pleasant View cemetery in Chester. (see Vol. 1, Families of Cavendish, Baldwin family). Contributed by Linda M. Welch, Dartmouth College, Windsor County researcher. 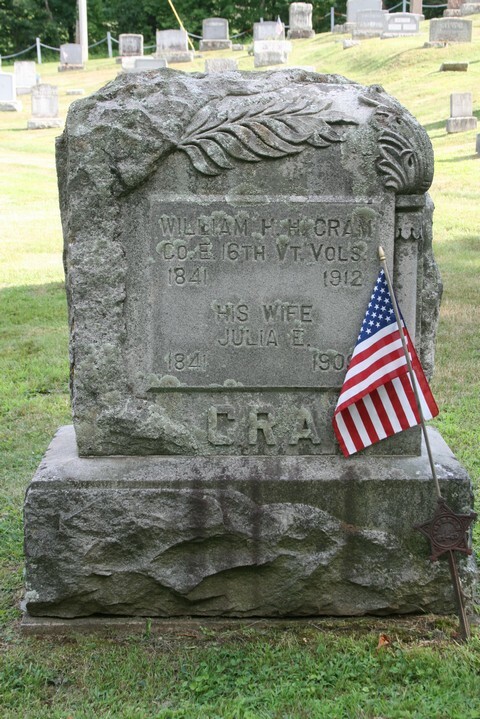 William H. H. Cram, who enlisted from Chester in Company E. of the 16th regiment, Vermont, and who was admitted to the Soldiers Home here July 20, 1909, died yesterday after a long illness, following an operation at one of Troy hospitals some months ago. The remains will be taken tomorrow to his home in Chester for interment. The death of Mr. Cram is the first that has occurred at the Home since June 19 of last year. During the first six months of last year there were fourteen deaths at the home, the same number as during 1909. It is somewhat remarkable that a period of six months should elapse at the institution, where there have been 90 to 100 inmates for a large portion of the time, without a single death.